It’s a taco soup kind of day! I actually got this recipe out of my local newspaper. It sounded delicious and said I could use turkey, hamburger or chicken. I picked ground turkey. It has tons of beans in it, 4 different varieties, green chilies, corn and a package of ranch seasonings and taco seasonings. My taste buds are thanking me today! And for the twist at the end: top your bowl with sour cream, shredded cheese and crushed tortilla chips. Time to tackle your bowl of taco soup on this football Sunday in America! Brown the meat, and then add all ingredients to the Crock Pot. Simmer until heated thru and hot. Keep warm until served. Serve with broken up tortilla chip pieces, sour cream and shredded cheese! Enjoy! 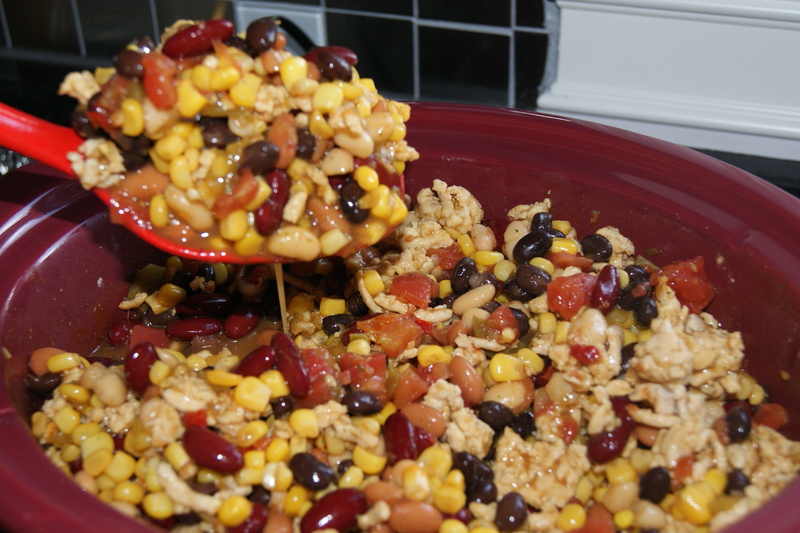 This entry was posted in Deliciousness and tagged Slow cooker, soup, taco, turkey. Bookmark the permalink. This soup looks delicious. Saving the recipe. Great for a New York winter. Jamie, Here’s the full recipe for taco soup! Great recipe! Made it Tuesday! This is very similar ton a Weight Watchers recipe! Thanks for sharing! You are welcome Kelli. One of my work friends made it on Tuesday also for her family!